Mozilla kindly sent me a preliminary data set of download pledges. This data is about 2 days old but should still be more or less instructive. I hope to get more up to date data soon and will update accordingly. 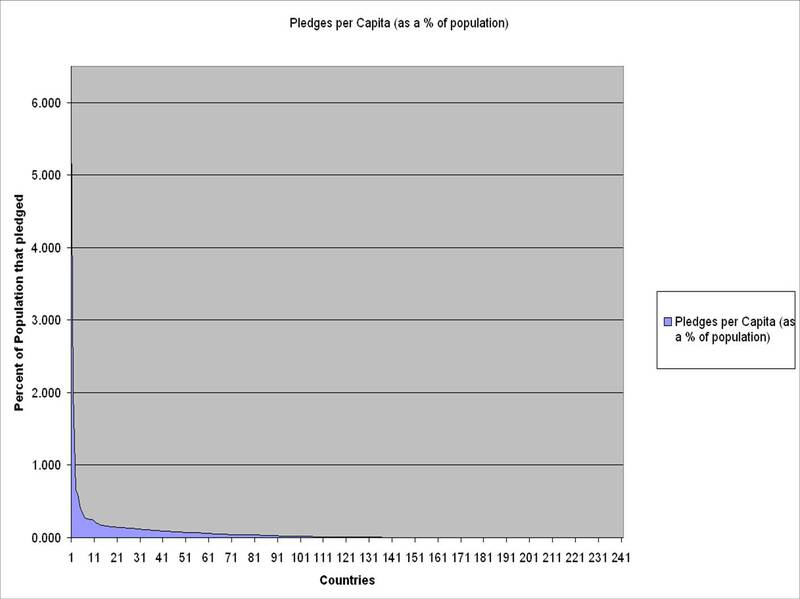 According to the raw data the 20 countries where the most people – as a % of the population – pledged to download Firefox. Population figures are based on those available on Wikipedia. On the one hand it is no surprise that many of these – about half – are small island countries with populations under 100,000 people. Moreover, 14 have populations under 500,000. Consequently, for many of these countries even a small number of absolute pledges translates into a high total percentage of the population. But I also think this says something about the economics of open source and the internet. It enables small isolated and sometimes neglected parts of the world economy to get effective, top of the line software for free, software that in turn enables them to participate in the global economy. But things get more interesting if we strip out the countries with populations under 500,000. This picture eliminates the small countries (which are, in some ways, outliers) and allows us to focus on the rest of the world (167 countries made this list). Here are the results for the top and bottom 20 countries. I admit that when I wrote the post on Monday about the correlation between the pentagon’s new map and the firefox pledge download map I thought that once the per capita data was analyzed it would sharply change the outcome. The reality is, it doesn’t. Core countries are far and away dominant on the list. In the bottom half of the list (84 of the 167 countries with populations over 500,000) only 4 countries are in the core: India, China, Mongolia and South Africa. (of course as a % of Function Core, or even the worlds’ population, this is a lot of people!). Eastern Europe is clearly an emerging open source powerhouse. Of the top 20 countries as a percentage pf population who pledged the top 3 are Eastern Europe and a total of 8 make the list. Only 4 of the countries are “non-integrated gap” countries all of which are transitioning (or arguably have transitioned, into “New Core” countries. Indeed, there is an argument that open source software allows new core countries to integrate into the core more rapidly by not only making some of the key tools that facilitate this transition more readily and cheaply, available but also by enabling the population to participate in their development thus building world class skills without the requisite FDI or multinational corporate investment. This entry was posted in free culture, open source, technology and tagged firefox, free culture, global economy, International Affairs, mozilla, open source, Pentagon's New Map, spread firefox, technology on June 18, 2008 by David Eaves. The correlation between downloads and the Gap/Core split is interesting, but aren’t they just surrogates for a more basic measure: Wealth. Most of the Gap countries are very poor, have largely agricultural economy and little computer use, so don’t use firefox. It would be intersting to see downloads versus GDP or some similar measure of wealth. Interesting – I think Singapore should be a “core” country – we have a no budget deficits, we have lots of International trading partners, etc.We are also a pretty modern society with all the amenities (including up to 100 mbps broadband) you may expect.Oh, the leadership has also been very very stable here – with the same political party being in power for over 20 years even with elections held every few years. I’m not sure what open source has to do with the numbers.Of the 9 million people who downloaded Firefox probably less than 1/10th of a percent will contribute to the project ever.This is about quality, price (or lack of), and competition with IE, NOT open source. You said “In short, the countries most in need of this software, software that is freely available, still are least likely to have the capacity and infrastructure to download it.” I disagree. Developing nations need simple software that requires litle from hardware ram, graphics processing, etc.). Imagine a five-year old PC with half a meg of RAM and an unaccelerated graphics card on a 800×600 monitor. They need stuff like small, basic word processing and spreadsheets. Don’t get me wrong, FF is great, and *everyone* needs secure, efficient software over dangerous bloatware, but if anyone wants to help developing nations by developing software, FF development is not the best place to be. I’d be looking at educational software or some kind of infrastructure stuff if it were me. To note: I think given the very bad conditions in Myanmar (Burma) and the capital Rangoon from their typhoon and frightened dictatorship who’ve worked to stop data entering/leaving the country to the point of including food aid… Their numbers is not so bad. The data is interesting but I wish there would be more information on the reasons why this is happening. First of all, I am Slovenian, I use firefox at home (on linux) and at work (on XP) as I am allowed to install it on the company’s machine. I downloaded an English version and love it due to many add-ons, from spelling in my native language to adblocking. Whenever I am asked which browser is better the answer is Firefox therefore all of my friends (and family) are using it as well. However this is not only my opinion. My colleagues agree and there are no questions being raised whether OSS is safe to use or not… Maybe the data can be attributed to this openness of mind? Well, just an idea. P. S. I second the questioning of Slovenia and Singapore being thought of as gap countris although this is not really what the article is about. The data is interesting but I wish there would be more information on the reasons why this is happening. First of all, I am Slovenian, I use firefox at home (on linux) and at work (on XP) as I am allowed to install it on the company’s machine. I downloaded an English version and love it due to many add-ons, from spelling in my native language to adblocking. Whenever I am asked which browser is better the answer is Firefox therefore all of my friends (and family) are using it as well. However this is not only my opinion. My colleagues agree and there are no questions being raised whether OSS is safe to use or not… Maybe the data can be attributed to this openness of mind? Well, just an idea.P. S. I second the questioning of Slovenia and Singapore being thought of as gap countris although this is not really what the article is about. So, almost 10 times the amount of people that pledged to download FF3.0 in Norway, did! I think a better metric for per capita is not the total population of the country, but the total internet-using population. You may find in such a metric that the African countries won’t be on the bottom of the list. What’s up with Lithuania – they have surpassed 10% by now already? And in the past couple of years Slovenia was the lead country in the world by percentage of FF usage! Slovenia was a part of ex Yugoslavia. It declared independence in 1991, which was followed by 10 days conflict – by no definition a war. It joined EU in 2004 and Euro region in 2007. It holds a presidency of EU right now! It is and always was Central European country. The OSS in strong in Slovenia – not because we don’t have money or are gap, crap or whatever. When you people talk about geography – learn first. Proud to be Slovenian ;)And in the past couple of years Slovenia was the lead country in the world by percentage of FF usage! Slovenia was a part of ex Yugoslavia.It declared independence in 1991, which was followed by 10 days conflict – by no definition a war.It joined EU in 2004 and Euro region in 2007.It holds a presidency of EU right now!It is and always was Central European country.The OSS in strong in Slovenia – not because we don’t have money or are gap, crap or whatever. When you people talk about geography – learn first. >It joined EU in 2004 and >Euro region in 2007.Euro currency, that is. Where is Bulgaria?!!?!?!?!?!? we are people tow. And we download firefox 3.
why there are no countrys like usa or spain, etc?